Big Boa has a face that looks like it has been beaten with the proverbial ugly stick. It's no wonder that he wears a unique protective helmet at all times. However, he also benefits from all the cybernetic gadgets attached to it. Thermal heat sensors show him the weak spots on his opponent's body, while amplified hearing lets him know just how quickly their hearts are pumping, something that can be attributred to the fear of standing in his presence. Anyone that challenges him usually ends up eating the dirt at his feet. Cobra Troopers can be an unruly bunch at times. They aren't motivated by patriotism, unit loyality, honor or sense of duty. It takes a brutal, unfeeling taskmaster to whip them into fighting shape and Big Boa fits the bill to a tee. He has a voice like a bullhorn, fists the size of frozen turkeys, and the disposition of a hungry bear. His infamous P.T. instruction is merciless enough to weed out the weak, but his mandatory after hours fight matches are what truly inspire only the most vicious to rise through the ranks of Cobra. Well that's nice - we get something new from this figure right off the bat! Big Boa was introduced in 1987, and there's never before been any mention of why he wore that weird helmet - he was a Cobra, and that was enough. Now we've got a suitably "GI Joe-ish" reason behind it, and it gets a new, updated sculpt. 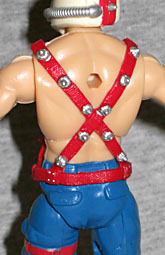 The breathing hose is no longer removable, which may be to his advantage: when I was a kid, he was such a tough fighter that the only way the Joes could beat him was to grab that hose and rip it free. One fewer weak spot! Like the filecard says, Big Boa needs to be big, and the figure delivers that perfectly. He uses the Resolute Roadblock body, so he's huge! There are no sculptural changes, which is okay: the paint does its part to help re-create the look. So rather than having sculpted groin padding, it's just a red stripe down the front of his pants, and instead of ribbed boots, they're just the normal kind. His canvas leggings are painted the same black as the boots beneath them, and have paired red patterns on the front of the shins. On the old figure, the red went all the way around the back of the leg, but here it's just in the front. He's got a new bit of deco in the form of the black Cobra logo on his left arm - what, like we wouldn't be able to figure out his allegience without that? His spiked harness is a separate piece, and those little buggers are sharp! Just like Jinx was a repurposed City Strike Scarlett, Big Boa gets his accessories come from another cancelled Rise of Cobra figure - in his case, "training gear" Duke. Well, there's a sledgehammer from the Cobra Shock Trooper, but the rest would have been Duke's, had he ever been released. There's a pugil stick - probably more painful than the padded ones used on American Gladiators - as well as one of those fancy adjustable dumbbells, all done in grey. 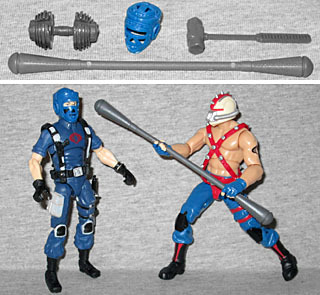 There's also a blue padded mask, which we were hoping meant that we'd be seeing Boa's face - but no, it's meant for the poor schlub he's beating up. Especially if the sledgehammer is a regular part of his training regimen. We're not done yet, though! 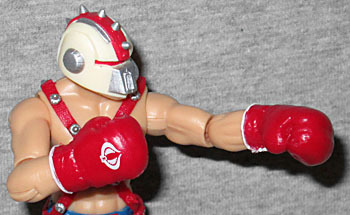 '87 Big Boa came with two red boxing gloves that slipped over his hands, while this one does not - he still gets boxing gloves, but you have to pull his hands out of the wrists and plug them in. That's kind of disappointing, since it means you can't just give the gloves to another character and make them a boxer, but maybe this was a cheaper way to manufacture them. The gloves are nicely detailed, molded in red, and painted with white trim and a tampographed Cobra logo on the back. Big Boa was a weird oddity in a line filled with weird oddities - taken by himself, he's no stranger than the accountant who dressed like a bird or the magic psychic, but doesn't a shirtless boxer seem somehow more out of place? Well, when he was originally conceived, he was going to have a rivalry with Rocky. Yes, "Sylvester Stallone" Rocky. Hasbro was planning to bring Rocky into the GI Joe franchise just like they had Sgt. Slaughter the year before. That deal fell through, but Big Boa, his Cobra counterpart, was released anyway. He never appeared on the cartoon or in the Marvel comics, which is probably why this is only his second action figure. It's a great update, though, and probably one of the biggest reasons fans signed up for the Figure Subscription Service.